"Well, I have never stolen anything. In fact, I have perfectly kept all of God's law. I have no problem keeping all of the commandments!" It was the Apostle Paul. That's right, Paul says in Philippians 3:6 that he has kept the Torah "faultlessly." He tells us that he was "Hebrew of Hebrews," and has no problem keeping the law perfectly. Yet Paul tells he considers all of this to be "garbage" compared to Christ. Why? Because of what it did to him. Despite this spotless record Paul considered himself to be "the worst of all sinners." Not because he had broken any commandments or laws. Again, he was "faultless" here he tells us. No, the reason Paul tells us is "because I was a blasphemer and a violent man." Paul had participated in the violent persecution of the followers of Jesus, and he did this because he thought he was being faithful to God. When Paul says he is a "blasphemer" this does not mean he was cussing. It means that because of his hurtful actions, he gave God a bad name. Today we experience the same thing: people who preach hate and hurt in God's name drive people from God. They give God a bad name, they make God seem like monster. When people reject this abusive image of God, that is not the blasphemy. The blasphemy, Paul tells us--his blasphemy that he came to be ashamed of--was misrepresenting who God was. As he writes (speaking to people like his former self) "God's name is blasphemed among the gentiles because of you." Now, the ironic thing is that when people like that preacher tell us that God will send us to hell for some minor infraction, they base this on Romans where Paul says "All have sinned and fallen short of the glory of God." Because of this, we get the idea that God is the one with the problem. So we need to tell people that God is really mad at them for some trivial thing they did. It's a message completely detached from life that paints God as a petty legalist. The thing is, this is not at all Paul's point in Romans. 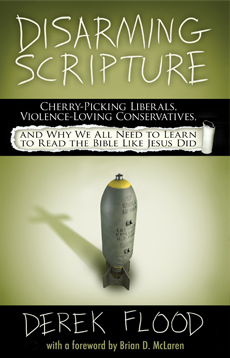 His focus when he says that above statement in Romans is on violence, and more specifically on religious violence. Paul is addressing a religious audience who want God to judge, who want wrath to be poured out on the hated Gentiles. Paul is telling them--and he knows this firsthand because he had participated in this religiously justified violence himself!--that this way leads to death. He is not addressing irreligious sinners and telling them to repent of law-breaking, he is addressing religious people who believe in divine retribution and telling them to repent of that. Now that is a sin that matters! If our only problem is that we tell a white lie or cuss when we stub our toe, then that is really pretty trivial. Many people would argue that God ought to be able to just overlook trivial things like that. After all, they would say, why can't God forgive like he tells us to? But what Paul is dealing with here is hatred, murder, and violence. People killing each other in the name of God and justice. Now we are dealing with some really serious heavy stuff that does real damage, devastating families, destroying lives. God cares about this because he cares about us. God cannot just overlook that, because it is really hurting people he loves. Paul is not talking about trivial infractions, he is talking about sin which devastates and destroys. Paul is talking about violence. Not only is this a very serious thing Paul is addressing, it is also quite subtle: It's pretty easy to recognize that alcoholism is bad (indeed it is a very serious sin that causes real harm). It's also easy to recognize that criminal behavior is bad (and it certainly is). But it's a lot harder to recognize the kind of thing Paul is addressing, because this is violence and hurt done in the name of God and justice. What Paul shows us is that you can be religiously "faultless" and still cause severe harm, still spread hate, still advocate for violence, but do it under the cover of God and country, do so while justifying your actions with the Bible! That was Paul's sin, and that is precisely what Paul is addressing in Romans. Paul is telling us that the gospel is about breaking out of that way of hurting others in God's name, breaking out of the logic of retributive justice, and entering into God's way of restorative justice demonstrated in Jesus Christ. That's an understanding of the gospel that is not only a much more accurate reading of what Paul is actually saying in Romans, but is also an extremely relevant message for us today. I thought you might enjoy this excerpt from the sayings of a simple Greek Priest/monk of Mt. Athos, Elder Porphyrios, who died in 1991. It is reflective of the Orthodox understanding of the radical non-judgment (in the sense of indignation and condemnation, not simple discernment) and enemy love required by the gospel. Its achievement in the life of the believer is seen as the goal of the Christian life--that is, the attainment of the fullness of Christ's life being lived out within one, the full attainment of Christlikeness (a.k.a., "theosis" or "deification" in the Orthodox Church). Re: the Mosaic law, I wonder whether Paul's claim to have followed it perfectly is a way of dismissing it--as if to say, "For followers of Jesus, the law is neither here nor there. I have followed it, but so what?" I have in mind his comment in Ephesians that Christ Jesus has "abrogated" the law. Christians are under the law of Christ rather than the law of Moses; therefore, it matters not whether we follow the latter completely or only in part...? Hope you and your fam are doing well. I tend to go with James Dunn who sees the issue as being about religious "boundary markers" of who is "in" and who is "out." That seems to be the context of Eph 2 as well where Paul talks about remeoving the "dividing wall of hostility" between Jews and gentiles. I certainly think the typical Luther-ish reading where we say "I don't need to be loving because I'm not under law" is not what Paul meant (not that you were implying that, I'm just saying). So I think the reason Paul is down on the law is because of how it can lead to us/them views that fuel violence. Personally, I've always been down on "rule keeping" because I saw it as legalistic and nowhere near as great as focusing on loving relationships. I still think that. But I think Paul is seeing something much more sinister that even legalism, he's seeing the bad fruit of religious violence. If this inside/outside thing that's connected with legalism is against God's will, can one really say one is keeping God's law and still worship this legalism? Yes, that is what Paul came to realize. As he would say, he had fulfilled the 'letter' of the law, but not the 'spirit' of the law, which reflects Christ and his way. Both Jesus and Paul came to understand faithfulness to God's law as consisting of acts of love, rather than legal observance. That is why Jesus actually broke several commandments (healing on the sabbath, touching the unclean, forgiving an adulteress, etc.) and broke these in order to be loving. The sermon on the mount is also about the need to go beyond the law in order to really be righteous. In some cases that means having a higher standard (not hating) but in other cases it means breaking with the law (loving enemies instead of an eye for an eye). In the law, the passage that says "love your neighbor" (Naechstenliebe) is referring to a fellow Hebrew. You love them, but of course hate the enemy and "show them no mercy" in war. That's why he says "but I tell you love your enemy." Jesus further expands that understanding of neighbor to show that the hated Samaritans can also a neighbor because being a neighbor is defined by acting in compassion, rather than by national or ethnic boundaries. The bottom line is that there are many ways of interpreting the OT, and Paul's former violent way was one them. Jesus shows us a different way, and what Paul realized was that Jesus was right. So Paul had to learn a new way of reading his Bible through the interpretive lens of Christ. Paul writes "to this day the same veil remains when the old covenant is read. It has not been removed, because only in Christ is it taken away" (2 Cor 3:14). 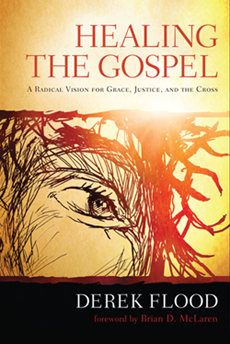 Many Christians read the OT and then see this as groundwork for how to understand Jesus. So Jesus is the judge who is holy and so on. That's backwards. The law does not define Jesus, Jesus defines the law. So we need to begin with Jesus and then go back and read the OT asking "does this reflect the way of Christ?" Luther therefore read looking for "was Christus treibt" as his standard. What Does Jesus Think About Homosexuality?